As a keen-eyed Japanese Twitter user noticed, during RX-Zeromaru’s transformation from SD to Realtype many of the cuts and poses are in direct reference to the super robot Fire Dagwon’s own transformation sequences from Brave Command Dagwon. As if the previous episode didn’t make Build Divers’ appreciation for SD Gundam Force obvious enough, we learn that Ayame was at one point part of a literal SD Gundam Force. Taking it further, said force includes a Storm Knight Tallgeese from that show. The rest represent a variety of what the SD Gundam franchise has to offer. The Jia Xu Ashtaron is a personification of the Romance of the Three Kingdoms figure from the Sangokuden anime. The white Jegan here, written stylistically in Japanese ateji, is from the samurai-themed SD Sengokuden setting. It’s also meant to resemble the AV-98 Ingram patrol Labor, since the short it appeared in was originally screened in theaters with Mobile Police Patlabor: The Movie. The Heavy Metal Gundam appeared briefly in episode 8 doing karaoke; maybe this is the same unit? The last founding member of the SD Gundam Force uses a Wizard Nu Gundam, from the original medieval-themed setting SD Gundam Gaiden. During Ayame’s montage of good times with her old Force, they hang out for a bit on the outside of the AEUG flagship Nahel Argama’s bridge. The details here are consistent with the version of the ship that appears in Gundam UC specifically. The SD Gundam Force’s home base is based on the country cabin Turn A pilot Loran and [spoiler] are shown living at in the last few minutes of Turn A Gundam. The first of these names (and the overall design) allude to the various settings among the SD Gundam franchise. “Knight” refers to Knight Gundam of the SD Gundam Gaiden setting. “Command” refers to Command Gundam of the military-themed SD Command Senki setting. “Lander” refers to the barbarian-themed Gundlander setting and its eponymous hero. “Voyager” refers to the time-travel-themed Gunvoyager setting (which itself is a pun on “Gunboy,” Mobile Suit Gundam’s working title). “Daishogun” refers to any number of super SD Gundams from the SD Sengokuden setting. 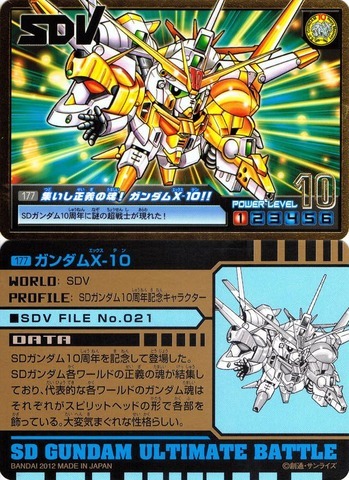 The name “Gundam X-30” is likely a reference to this as a conceptual successor to the Gundam X-10, a Carddass (vending machine trading cards) design commemorating the 10th anniversary of SD Gundam. Since SD Gundam began in 1985, it’s been more like 33 years. This may imply that the dissolution of the SD Gundam Force was a few years ago (remember, avatars don’t necessarily reflect age). The last of these names, “Kizuna Gundam,” refers to the bond the Force shared, since “kizuna” (絆) means “bonds” in Japanese. 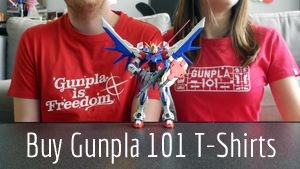 Since this Gunpla is actually controlled from the inside by the Wizard Nu Gundam, this may also be an indirect reference to the mobile suit-like Machine Soldiers piloted by the SD characters in the theatrical anime SD Gundam Matsuri. This Vagan mobile suit makes only one appearance in all of Gundam AGE: the epilogue episode for its second generation arc. It didn’t even make it into the Memory of Eden compilation! It is dispatched in the TV series by the Gundam AGE-2 customized in the fallen ace pilot Woolf Enneacle’s white color scheme. This customized version of the Jenice mobile suit was piloted by the Vulture Wedoba Morte in the second episode of Gundam X. The steampunk Burikimaru is from the 2003 installment of the long-running Musha Gundam line in the SD Sengokuden setting. The fallen ninja Barzam (its name also rendered in ateji), on the other hand, also belongs in the same setting but dates back to the original series of Carddass trading cards.